There are around 400 different species of willow, found mostly in the northern hemisphere where it thrives due to our moist soil and cold, temperate climates. Legend has it that the poet Alexander Pope planted the first willow tree in England. He did this by using a twig from a parcel of figs tied with willow twigs which had come from Turkey (or Spain, or Portugal…) and that twigs from his willow were even sent to Catherine the Great in St Petersburg. Whether the tale is fact or fiction is another matter, but we think it’s a lovely story. Willows famously have soft and pliant, yet tough wood and are incredibly tenacious, readily taking root from cuttings or even broken branches. The flexibility of their highly pliable stems makes them ideal for making all sorts of structures from hurdles to huts to archways and the ancient art of basket weaving – thought to be one of the most widely practiced crafts throughout history. Inspired by a weekend willow sculpting course, a British artist known as Anna & the Willow has created some incredible nature-inspired sculptures made from English-grown willow rods – specifically, six varieties of English willow grown in Somerset and Yorkshire. Anna first started working with willow 10 years ago when she took a weekend sculpting course. 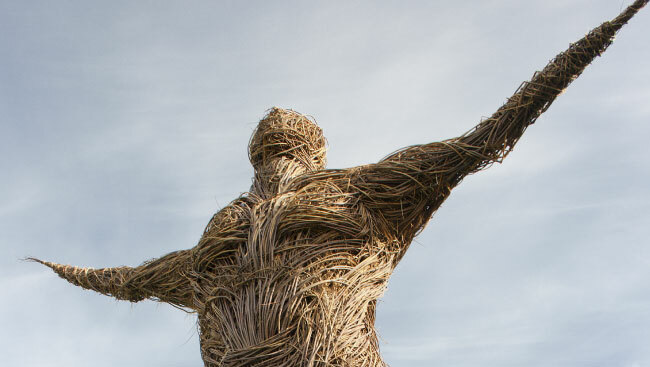 As well as crafting willow baskets and small gifts, her beautiful, life-size willow sculptures are created by using traditional techniques in an remarkable way. Firstly, each piece is planned with hand-drawn sketches and then bespoke steel frames create the initial structure. After that, Anna works her magic by layering interwoven willow rods onto the framework until the finished sculpture is revealed. A female archer – The Huntress of Skipton Castle – is seen shooting a bow and arrow while life-size animals include a horse and stag. All of the sculptures are placed in ancient woodland to magnificent and arresting effect.